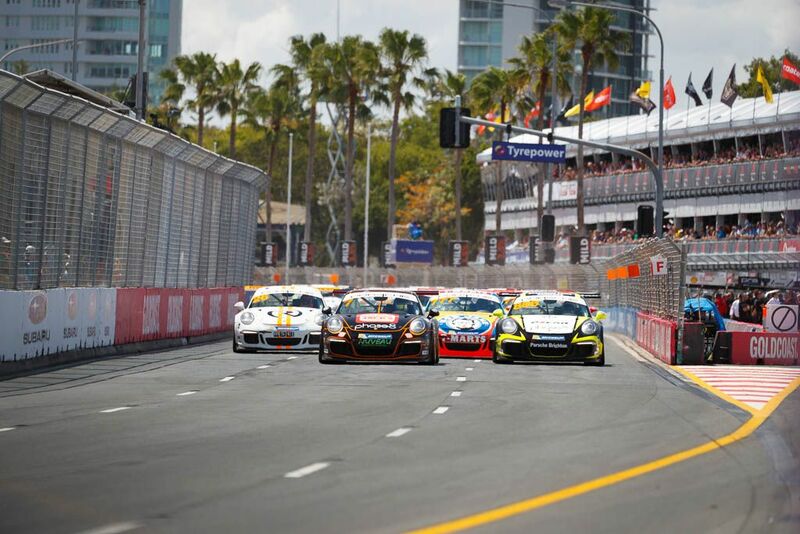 After the momentum from Bathurst we were really looking forward to racing on the streets of Surfers Paradise in the final round of the Porsche Carrera Cup championship. 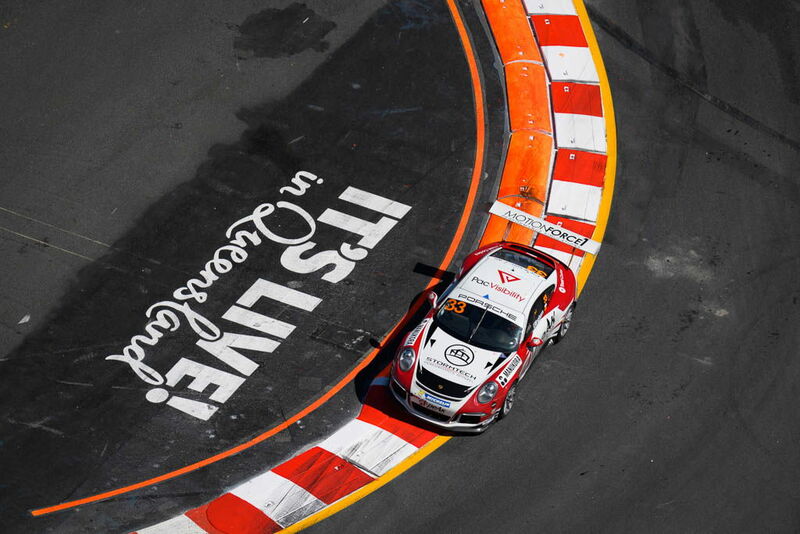 Although it is our home track both of our drivers had never driven on the demanding and unforgiving circuit. Fortunately we had our secret weapon, MR Works Driver and Driving Coach Warren Luff who was also racing for Mobil 1/ HSV Racing in the V8 Supercars main event. 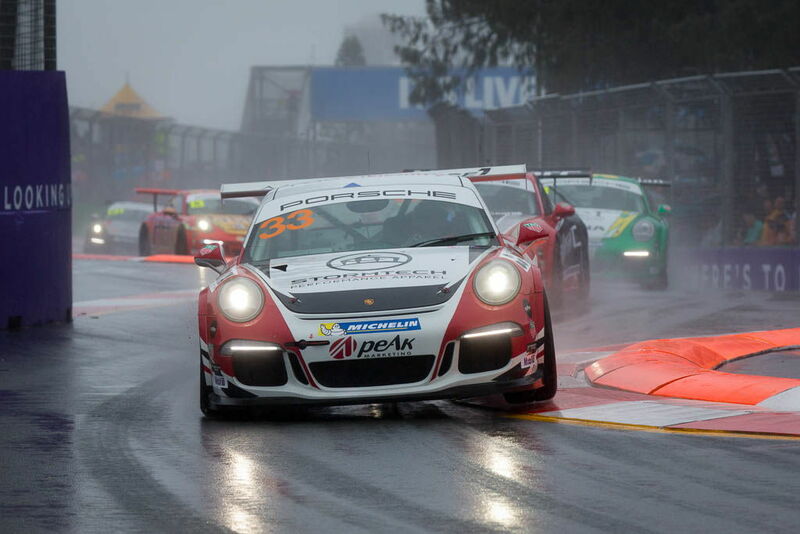 The second race of the weekend was the 28-lap finale of the Carrera Cup Endurance Cup with a sprint race for the season finale just prior to the final race of the Vodafone Gold Coast 600. In qualifying Jaxon was 3rd fastest respectively putting him on the second row for the opening race. 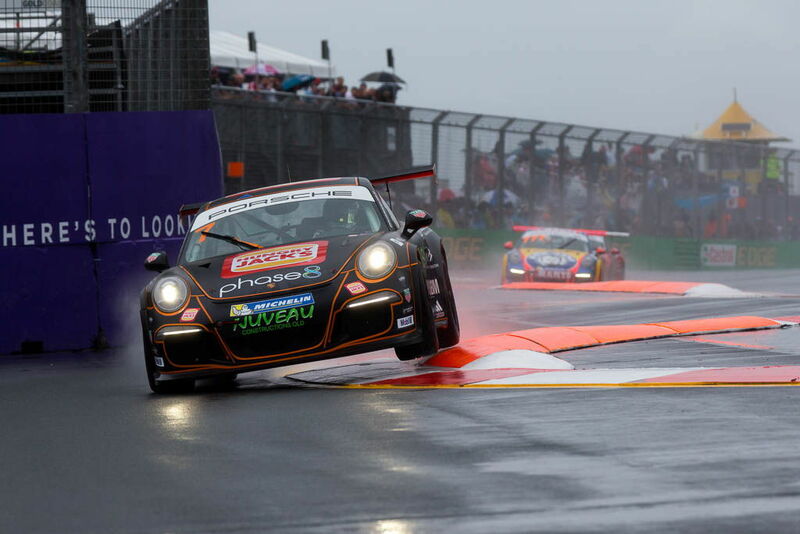 The opening race started under the Porsche Safety Car due to the atrocious weather conditions but once the racing got underway it didn't take long for him to work his way through to the lead. 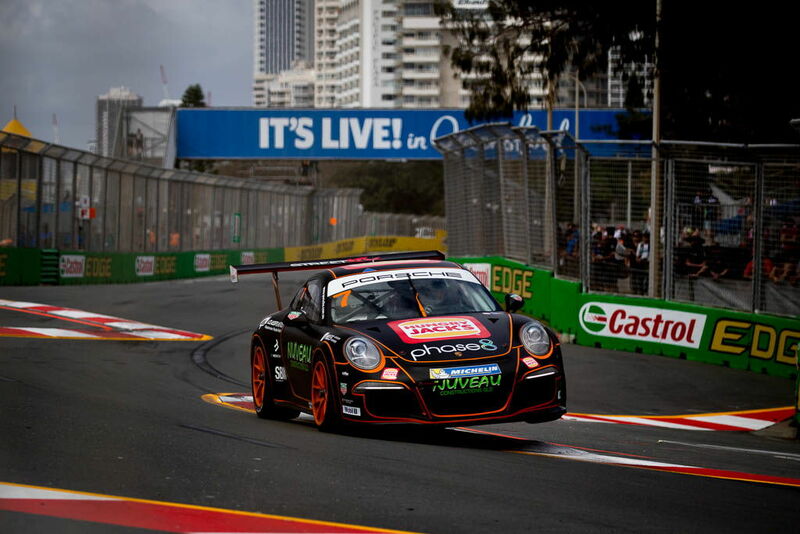 He then pulled an impressive margin leading the field by 10.5 seconds by the end of the race: the largest ever for a Carrera Cup race on any variation of the Gold Coast street circuit. In the second race although starting from pole Jaxon was out-dragged to the first corner by Heimgartner and despite having more pace at various points of the race he was unable to get by and settled for a quiet second place. In the final race starting from grid 2 Jaxon was able to get the jump on Heimgartner and led the field into turn 1. He drove a beautifully measured race to hold a 1.5 second gap to a hard charging Davison. This was Jaxon's 5th race win and second round win of the season. It was Simons first visit to the unforgiving circuit and he spent the first very wet race adapting his driving style and most importantly, staying out of trouble. In the second race on Sunday morning, he was happy to have a dry track to play on. He got a decent start, then he settled into a groove to get better as the race went on. In the final race he recorded his fastest lap of the weekend which was only 1.5 seconds off winning team-mate Jaxon's best time and is a testament to his consistency and ongoing development as a racing driver. Well that’s the 2017 Porsche Carrera Cup season done and dusted! It was a phenomenal weekend for Jaxon, winning two more races and his second round win for the season. It also gives him great momentum to carry into his championship campaign in 2018. Fifth in the Pro championship was a direct result of some unfinished races due to circumstances beyond his control and not a fair reflection of his potential. 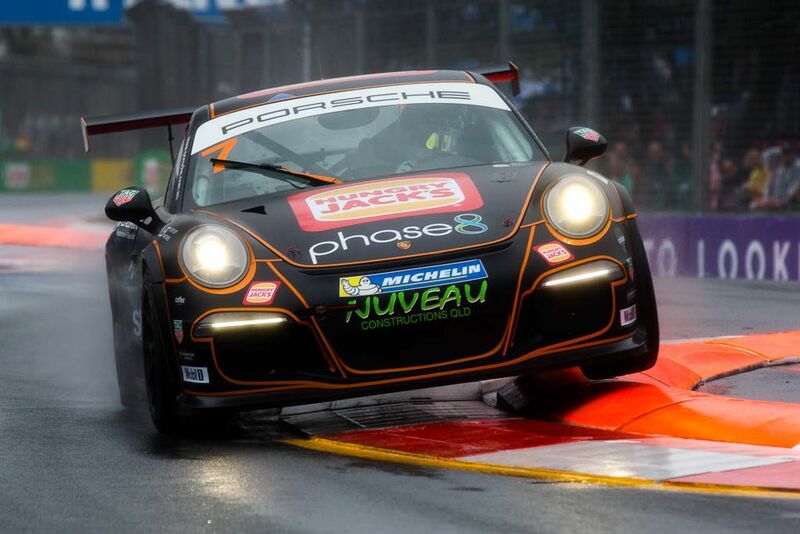 2017 was Simon’s first season in the white hot Carrera Cup championship and a significant year in his development as a race driver. Although it is unlikely he will contest the 2018 Carrera Cup championship we look forward to seeing him on the grid perhaps in another category next year. It was also a great result for Tim with him receiving the "Fastest Lap Award" despite only having done four of the eight rounds of the championship. This is the same award we helped Shane Smollen win last year. We are excited to confirm Tim in our Carrera Cup team for next year and we will have our sights firmly set on the 2018 Pro-Am title. Many thanks to all the awesome boys and girls in the MR Carrera Cup team as well as our drivers, their families and partners. We are now off to NZ to contest the final 2 rounds of the Australian GT Endurance Championship starting next weekend at Hampton Downs. 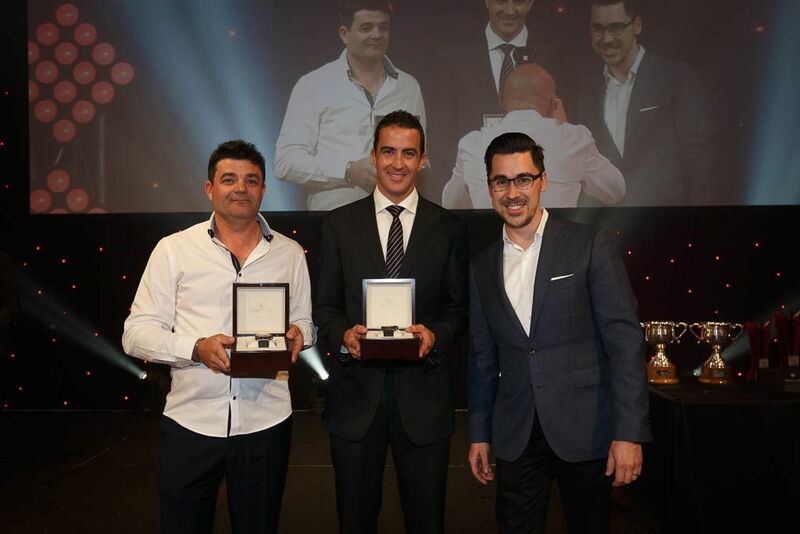 Team Manager Leigh 'Lethal' Geyer at the Porsche presentation dinner collecting Tim's beautiful new Tag Heuer watch for the Fastest Lap Award. One of our former drivers and member of the MR family Alex Davison collected the award for Pro class.